We wish to inform you that our Rakuten FX trading platforms updates will be implemented on 10th November, 2018. You can enjoy faster and smoother order execution experience after the updates. “1-Click Order” allows you to have a faster and smoother order execution. To activate the new function, please follow the steps below. There is a new “1-Click Order” button added in the right click menu under Open Position. Click the “Activate 1 Click Order”. Please read the disclaimer carefully and click “I Accept the terms of this agreement” if agreed. Now, the “1-Click Order” button is changed to “ON”. You can close the open position with the “1-Click Order” function by clicking the rate under ‘Market Rate”. Go to “Open Positions”, then right click the open positon window. You can see the newly added item “Go to Order Blotter”. Now you can view all the pending orders in one window. Initial margin is now displayed in the Open Position section when you attempt to open a position. 4. “ Ticket # ” is displayed as default. Ticket # is displayed in the Open Position section as default. Certain functions are renamed as below. 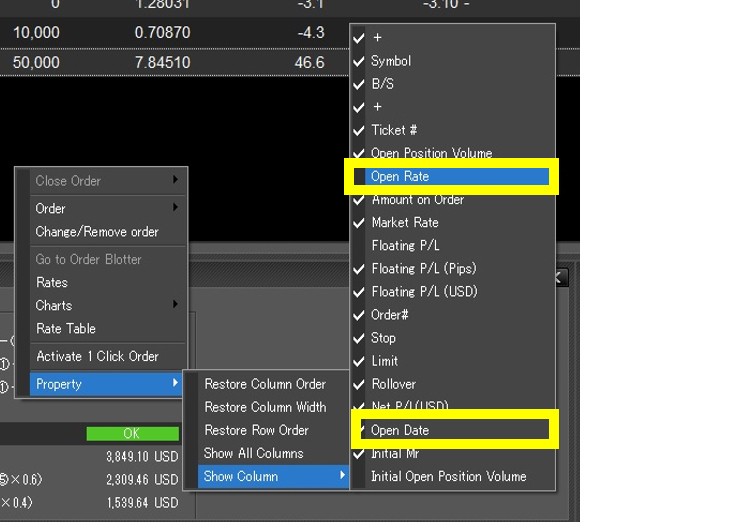 The “Executed(Entry)” button is changed to “Open Rate”. The “Execution Date/Time” button is changed to “Open Date”. “Floating P/L” is renamed as “P/L”. “Floating P/L (Pips)” is renamed as “P/L (Pips)”. “Floating P/L (Dnment CCY)” is renamed as “P/L (HKD)” or “P/L (USD)”. Base on the account’s denominated currency that (USD) or (HKD) will be displayed correspondingly. To add or remove the column on Open Position section, right click then choose Property > Show column > tick or untick the particular option from the manual. “Floating P/L in Acct Ccy.” is renamed as “Floating P/L(HKD)” or “Floating P/L(USD)”. “Trading P/L (Dnmnt CCY)” is renamed as “P/L(HKD)” or “P/L(USD)”. “Execution Date” is renamed as “Open Date”. “Total Rollover” is renamed as “Rollover”. “Execution(Entry) is renamed as “Open Rate”. (USD) or (HKD) will be displayed correspondingly based on the account’s denominated currency. 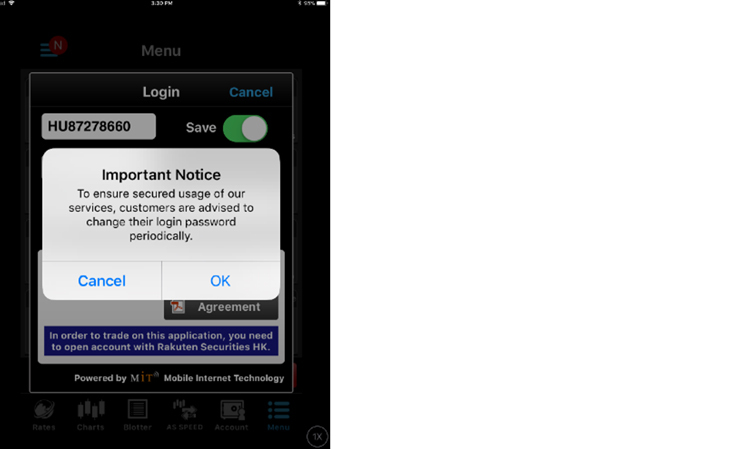 In order to protect clients’ interest, you are advised to change your password regularly.